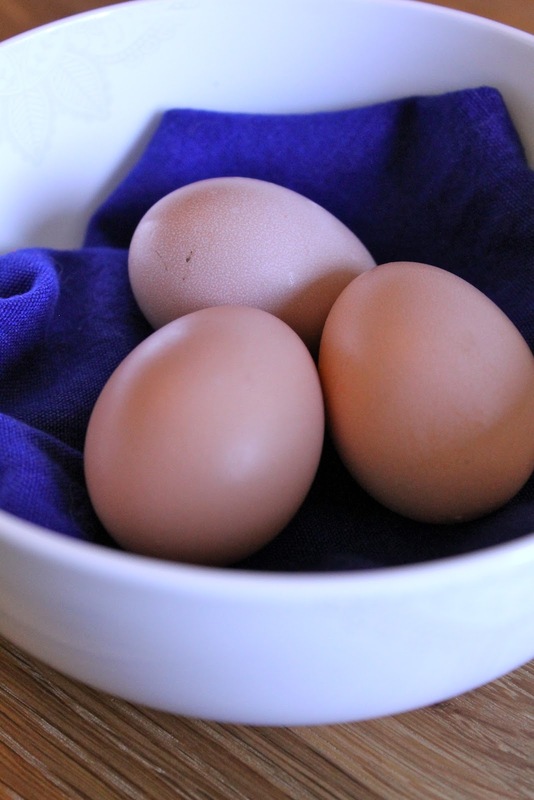 Bossy Italian Wife : Steam Farm Fresh Eggs for Easy Peeling! I have my chickens now for five months, and it took me that long to figure out how to properly hard cook the eggs to get the shells to peel off. And you know what? It wasn't even me who figured it out--it was my mother-in-law. She had creatively been poking and cooking my farm fresh eggs until she nailed the perfect way to get them to peel without chipping the egg itself. Thank you, Chris, I am FOREVER in your debt because of this. ...Now, I went ahead and used my veggie steamer because this was the easiest way. I got to a boil, set the timer, lowered the heat a bit and then I went to the opposite side of the house where I forgot entirely that I was trying to experiment with eggs. I was in the middle of what should have been a relaxing meditation when I heard a faint beeping noise somewhere in the house. My first thought? I've never heard a beeping in my subconscious before while meditating; how interesting. My second thought: HOLY F*CK THE EGGS! I went bounding from my meditative state and into the kitchen where I discovered that the timer was going off and that all of the water under the steamer had evaoorated. I panicked and put the pot under the water and ran it and then removed the eggs. and rinsed them with cold water. Then I took a moment to stare at the eggs, and the pot, and wonder if I had ruined my pot. You will be happy to know, it survived--thanks Cuisinart! Anyway, I put the eggs in the fridge after that and shook my head in disbelief of the weirdness of the whole moment. I rarely EVER forget that I am cooking something on the stove. I have my moments, though. Place steamer in a medium saucepan. Fill the bottom with water (up to where the steamer ends). Place eggs in the steamer and place on medium high heat. Allow them to steam for 20 minutes (try not to forget about them). Remove from heat and plunge in ice bath if you desire. Peel 'em like a champ!! !